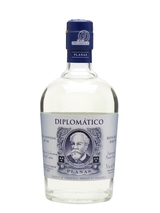 Diplomático Blanco Reserva is a superb blend of copper pot and column still rums. Aged to perfection in small oak casks for up to six years, this product embodies the elegant characteristics of Diplomático Rums. The complex filtration process carried out prior to bottling gives this rum its crystal clear appearance and smooth finish. Colour: transparent and clear. Nose: Rich and surprisingly intense for a white rum. Aromas of vanilla, freshly ground coffee, cream, dry coconut and oak. Mouth: Creamy with coconut and mocha coffee notes, slightly fruity, balanced and a complex and delicate finish. Serving Suggestions: Neat or on the rocks. It also stands out as an excellent option for delicate cocktails such as a Hemingway Daiquiri, Mojito Royal, and Blanco & Tonic. It almost doesn't seem fair to stack up this "extra añejo" rum against barely-aged counterparts. This is the Cadillac of white rums, one of the few suitable to keep as a standalone sipper. Look for silky smoothness and pure, concentrated sugarcane flavor that mellows into accents of brown sugar, -caramel and baking spice on the finish.